In a detailed note, well-known civil rights organization, Citizens for Justice and Peace (CJP), which has taken up the cause of lakhs of people in Assam who are in danger of being permanently declared “foreigner”, has said that, with less than 10 days to go for re-submitting claims for citizenship before the National Register of Citizens (NRC) offices, the future of nearly 32 lakh people is at stake. 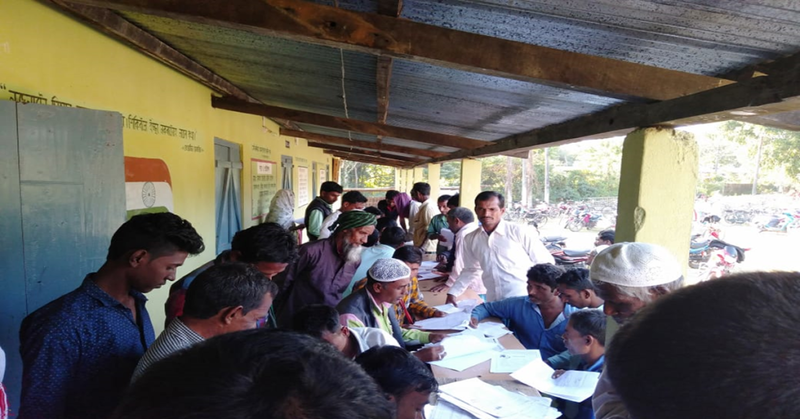 Even as the December 15 deadline for filing NRC Claim forms looms large, nearly 32 lakh people are yet to file their claims. Over the last 73 days, only 8,10,000 people have been able to complete the process. That comes to approximately 11,095 application filed per day. Given how now there are less than ten days left, out of which only five are working days, it is obvious that the remaining people will not be able to complete the application process in time! A total of 40,07,707 persons failed to find their names in the NRC final draft that was published on July 30, 2018. This means, more than 80 percent of the people whose names had not been included in the NRC yet to submit their applications as a part of the claims and objections process. The fast approaching deadline is only casting a dark shadow over their future. What will happen to those who fail to submit their claim applications within stimulated period? According to Prof Taizuddin Ahmed, who teaches political science at Bhawanipur Anchalik College, there are two possibilities: If you submit claim forms and your name remains out of final NRC your case may be referred to Foreigners Tribunal; or if you don’t submit your claim form there is high probability of being declared ‘foreigner’. Moreover there are 7 list B documents viz; 1) Birth certificate, 2) Land documents, 3) Board/ university certificates, 4) Bank/ LIC/ post office policy documents, 5) Circle officer / lot mandal / Panchayat secretary certificates, 6) Voters list, 7) Ration card and 8) Others. Among these seven documents, many are not easily available for economically weak and uneducated people, women and children. Though the voters list is a universal documents it excludes the population under 18 years of age and married women can’t connect with their inherents as father’s name is not available with the name of a married woman in the voters list. Though the ration card of a family could have been used for the linkage documents, not a single ration card has issuing date with the seal and signature of the issuing authority. So, all ration cards submitted so far have been rejected all over the state. The only alternative that was for the poor, uneducated woman was Panchayat secretary certificates which too was rejected largely during verification. The Supreme Court that permitted the acceptance of Panchayat secretary certificates stipulated that this was pending proper verification. But, the officials of NRC Authority from top to bottom rejected Panchayat secretary certificates who failed to submit additional document to that of Panchayat secretary certificates. On December 1, Prateek Hajela, state coordinator, NRC, issued an additional order to all DRCR of the State, where he has maintained that the married woman, who have no other documents to Panchayat secretary certificates should be verified as per Supreme Court directives. But, an overwhelming majority of ground level officials appear to be quite ignorant about the Supreme Court directives. So, people are afraid about the situation that a document rejected once may not be acceptable again. So, everyone searching for the alternative documents which may be a substitute to Panchayat Secretary Certificate. But the door is closed for such alternative as in SOP it is strictly mentioned that any documents issued after August 31, 2015 will not be acceptable as List B documents for claim applications. When Team CJP was monitoring the NSK centre it found in Narayanpur NSK in Baksa District that one LRCR was rejecting a land document of 1969 only because of the copy of the document was issued in 1987. Bedanta Bora, the LRCR of the opinion that the document was issued after 1971 so it can’t be a legacy document. At that time Shanti Ranjan Mitra of the Forum for Social Harmony, who was part of the CJP delegation asked, “I have passed the matriculation examination in 1965. I had lost my Admit card of that Examination. I have bring collected duplicate copy of that Admit card only on yesterday. Is it a document of 1965 or 2018?” Shanti Ranjan Mitra asked the question repeatedly, but the LRCR didn’t cite a single word. Still, the distressed people have not given up their efforts to collect alternative documents. The community volunteers of CJP along with hundreds of educated youth, students and informed people are extending helping hands to gather alternative documents for claim applications. The people who have submitted wrong legacy data due to similarities of names of their legacy person are searching hard for their genuine legacy person and their legacy data codes, which is also a toughest work. But, they are still searching, they are still fighting, because giving up is not an option.